Yesterday, Fitbit officially announced their partnership with luxury fashion designer Tory Burch. The designer will be working with the wearable fitness company to offer a new collection of fashionable accessories for the Fitbit Flex activity tracker. Fitbit featured design sketches of some of the accessories on their blog and confirmed that bracelets, pendants and wristbands will be sold on the Fitbit and Tory Burch websites in the Spring of this year. Fashion has been a major missing ingredient for most wearables to date. The original Pebble, Galaxy Gear and especially Google Glass have consistently been under fire for being way too geek and far less chic for the everyday user. But the tides are changing and Fitbit’s partnership with Burch is just one of many signs that wearables are getting ready to strut their stuff on the runway. The Burch-Fitbit partnership joins Intel’s move to work with the fashion industry in making wearables that people actually want to wear. During CES, Intel announced that they will be working with fashion industry leaders like Barney’s, The Council of Fashion Designers of America (the CFDA) and Opening Ceremony. Although specifics were scarce, Intel hinted that their first creation will be a smart bracelet designed with Opening Ceremony and sold at high-end retailer Barneys. Sony also dipped their toes in the fashion pool at CES, showing off some potential new accessories for their Fitbit-competitor, Core. Although only prototypes at this time, Sony’s showcase was filled with patterned bracelets, pendants and watch-like jewelry which could be great alternatives for those not interested in wearing the vinyl neon wristband the device will launch with. Sony recently announced they will be splashing a fresh coat of paint on their Smartwatch 2 in hopes a new look will drum up some sales. The device, which launched last year, will come in a new silver-plated metal option and a FIFA World Cup 2014 edition. Of course, a metal smartwatch design isn’t new. Pebble also began to offer this sleeker, more professional version earlier this month as the Pebble Steel. Google has also been busy trying to make Glass cooler. Last week, Google released new prescription frames and sunglass visors for Explorers on their website. Google worked with sunglass boutiques Maui Jim and Zeal Optics on the two new sunglass visors for the device and designed the four prescription styles in-house. It is still expected that design partnerships with the likes of Ray-Ban and Warby Parker are in the works for go-forward styles. But fashion isn’t always an afterthought for wearable tech companies. Lumobody Tech’s new device, the Lumo Lift, is created to be just as much an accessory as it is to solve shoulder slouching. “Lumo Lift is wearable tech that is more than just wearable tech, it’s fashionable tech,” Monisha Perkash , CEO and Co-Founder of Lumobody Tech told Betakit. “It is closing the gap where tech meets fashion”. 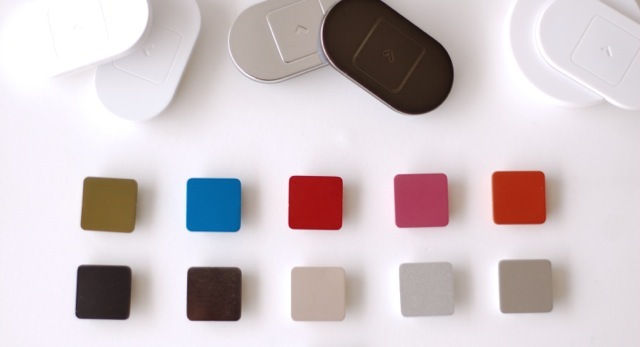 The Lift, which has raised nearly one million dollars in pre-orders on the companies site so far, is a small sensor that tracks your daily activity and helps you improve your posture. The badge-like device can be worn under your clothing or as a piece of jewelry. To help you accessorize, Lumo is offering design clasps which come in different colors, finishes and styles. “Fashion is largely about self-expression. Lumo Lift allows you to express yourself through customizable clasps that come in a variety of designs and suit diverse fashion tastes,” says Perkash. Lumo is offering four different types of clasp packs including a designer pack which features jewel-like options. Perkash believes that fashion is an imperative ingredient to the success of wearable tech. “Fashion raises the bar for the wearable tech industry, requiring products not only to work but also to be appealing,” she told us. “As wearable tech aspires to become a part of people’s habits, we can learn from the most successful fashions and beauty products that have been able to do this”. Making them “luxury” and putting snakeskin texture on them just looks geeky AND tacky. Maybe they should hire Braun’s designers.